In addition to well informed help and advice we offer a range of services including: home approval scheme, home consultation, corporate work, mail order service, flexible payment options and free home delivery to the local area. 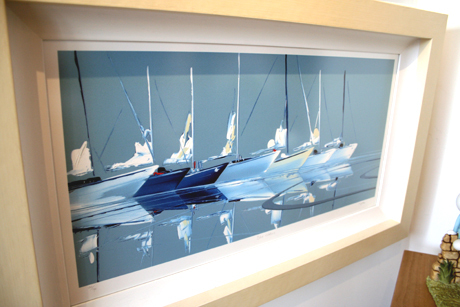 There is also a fast and efficient bespoke framing service offered with free advice from our experienced in-house picture framing team. 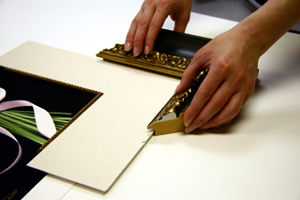 Frame design encompasses so much more than simply putting a frame around your artwork. The size, colour, texture, and style must work together to enhance your art while simultaneously complementing your unique personality and style. Our experienced team, equipped with the latest materials, and most current information, bring their creativity to every individual job. Honesty and integrity combined with our experience allows us to meet our client's needs, and exceed their expectations. Our commitment is to ensure that you will be enjoying your painting, print, photograph - or memorabilia - for many years to come. When a picture catches your eye it is often difficult to imagine how it would look in your home. Questions like "will it go with my decor?" and "is it the right size?" can soon be answered. Take advantage of our Home Approval - no obligation service, which gives you the opportunity to view a picture in your home before you buy. Here at Trew Art we believe it is always helpful to be able to see the art piece chosen in your own home before finally buying. That way you can ensure that you will be enjoying your purchase for many years to come. We believe it is always helpful to be able to see the art piece chosen in your own home before finally buying.